Great for beginners, non-swimmers and first-time visitors to Tropical North Queensland cruise to Agincourt Reef from Port Douglas. You can watch fish feeding, go on a snorkeling expedition, try scuba diving, view the coral and marine life on a semi-submersible submarine, and enjoy a tasty buffet lunch. For a prestigious Great Barrier Reef experience, take a ride on an ultra-modern, high-speed, luxury catamaran to three Outer Reef sites for the best diving and snorkeling out of Port Douglas. The cruise includes a seafood buffet lunch, a reef interpretation talk and a guided snorkel tour of Agincourt Reef. Enjoy a greater level of comfort and service on this luxury cruise to some of the Great Barrier Reefs premier diving sites. Explore the very outer Great Barrier Reef in luxury and style with Calypso. The custom designed vessel will take you to Agincourt or Opal Reef, both regarded as some of the most significant sites on the Great Barrier Reef. Snorkeling is the easiest way to experience the reef or try an introductory dive, no experience required. For the advanced divers, certified diving is available. 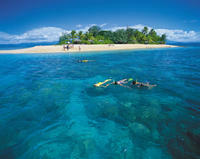 Let Calypso take you to the outer edge of the Great Barrier Reef and explore the rich and diverse coral gardens. Kayak along the palm-fringed coast of Queensland, gliding across the waters of the Coral Sea and taking in views of rainforest-clad mountains on this kayaking tour from Port Douglas. From the seat of your kayak, you'll have a prime opportunity to spot native marine life like green turtles, sea birds, rays, fish, and occasional dugongs and dolphins, if you're lucky. Hotel pickup and drop-off and all equipment are provided. If you love nature and the water, then this is the perfect tour for you! Within an ancient rainforest, step into the cool, crystal clear water and drift with the current as you explore life under the waters surface. Watch fish dart in and around the river stones and keep your eyes out for the occasional turtle. This family-friendly tour is a perfect way to stay cool in the hot tropics and is a great introduction to snorkeling before heading out to the reefs. Small children can journey down the river on large river sleds. Cruise to the Outer Great Barrier Reef from Port Douglas aboard AquaQuest, the newest luxury dive and snorkel vessel in Port Douglas. Join the friendly and professional crew for an awesome day trip to the best of the Outer Reef. AquaQuest is a brand new custom built luxury dive and snorkel introduced to Port Douglas in July 2017. She is fully equipped with the most modern and state of the art facilities including Nitrox. As the newest vessel in Port Douglas she will give passengers an unrivaled comfort with the best experience available as we visit some of the best dive and snorkel locations on the Outer Great Barrier Reef at Agincourt, Opal and St Crispin's Reefs.